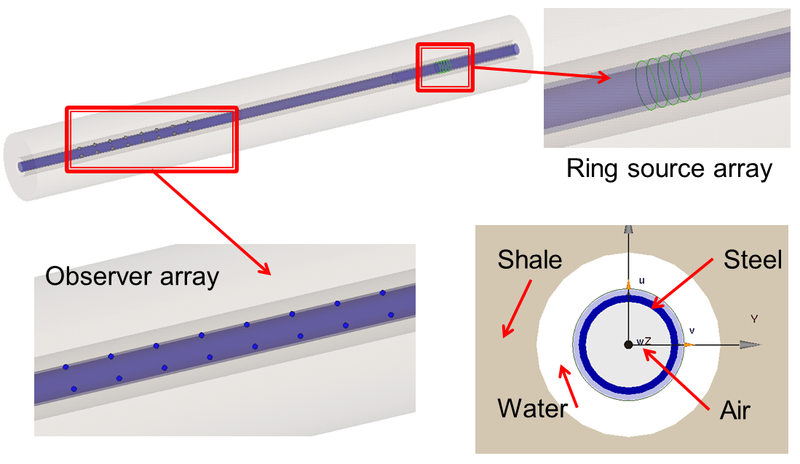 Sonic logging is very useful for hydrocarbon exploration in geological related engineering problems. It is a well logging tool that usually set in a borehole. A monopole or dipole source can be applied at the terminal, and a target formation’s interval transit time of the compressional P- and shear S-, waves can be measured. The measured data provides useful information of a formation’s capacity to transmit seismic waves. Geologically, the formation’s capacity varies with lithology and rock textures, most notably decreasing with an increasing effective porosity. This means that a sonic log can be used to estimate the underground structure. 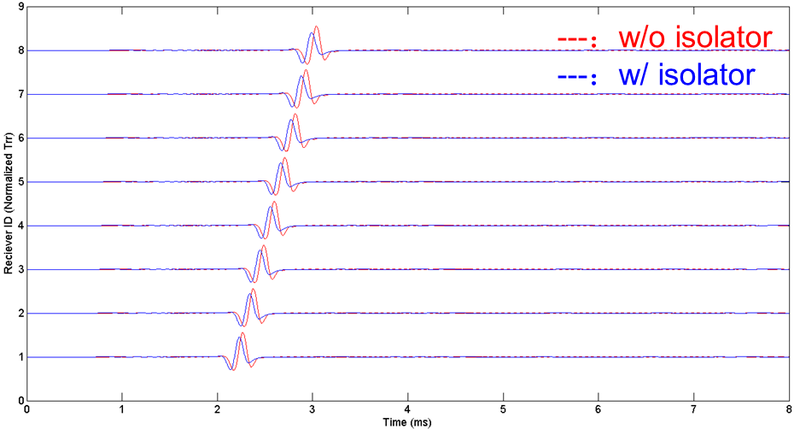 The acoustic waves recorded by a sonic logging tool is highly depending on the energy source, the trajectory they take and the characteristics of the formation and the borehole. When the refracted P-wave becomes parallel to the borehole-formation interface, it propagates along the interface at speed of Vp, such a wave is faster than the reflected borehole-fluid wave. Every point on an interface excited by a P-wave are equivalently acting as a secondary source. The combination of these secondary waves in the borehole creates a new linear wavefront which is typically named as head wave. This head wave in the formation is known as the compressional head wave, and its arrival at the receivers is recorded as the P arrival. The P-wave takes longer to arrive at receivers that are farther from the source. The time difference between P arrivals divided by the distance traveled is know as transit time, or slowness, and is the reciprocal of speed. This is the most basic sonic-logging measurement. Fig. 1. 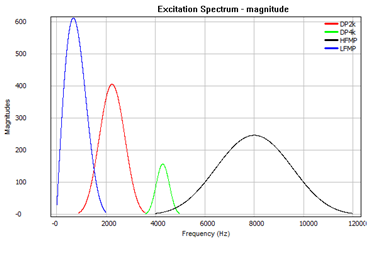 Excitation types. (a) Left: point Monopolel; Right: Point dipole; (b) From left to right: 0th, 1st, 2nd, 4th, 6th, 8th order ring source. Fig. 2. Supported internal signals. Fig. 3. Automatically modulated source signal. 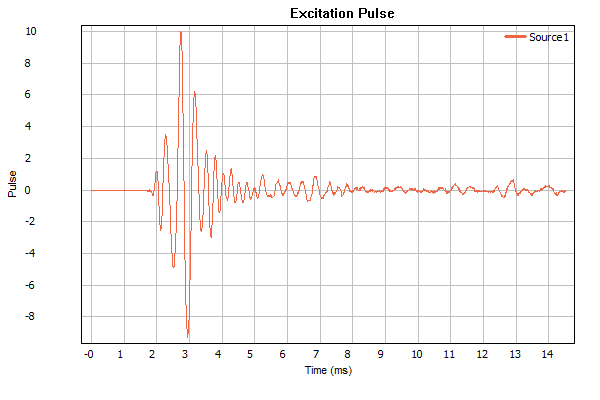 Left: Transient pulse, right: spectrum. Fig. 4. 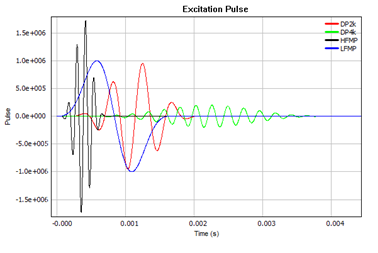 Arbitrary user-defined input pulse signal. 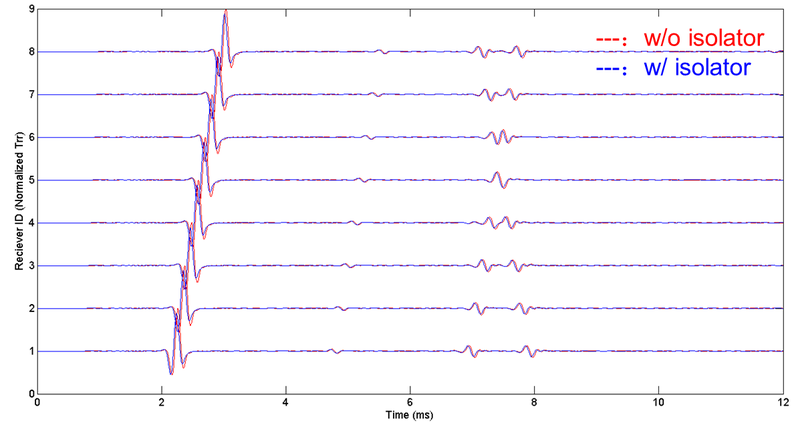 Left: Transient pulse, right: spectrum. Fig. 5. Acoustic isolator study: basic model setup. Fig. 6. Investigate two possible solutions. Fig. 7. Impacts on logging signals recorded. Left: slotted isolator, right: lossy material. Fig. 8. Whole device performance analysis with and without isolator. Fig. 9. 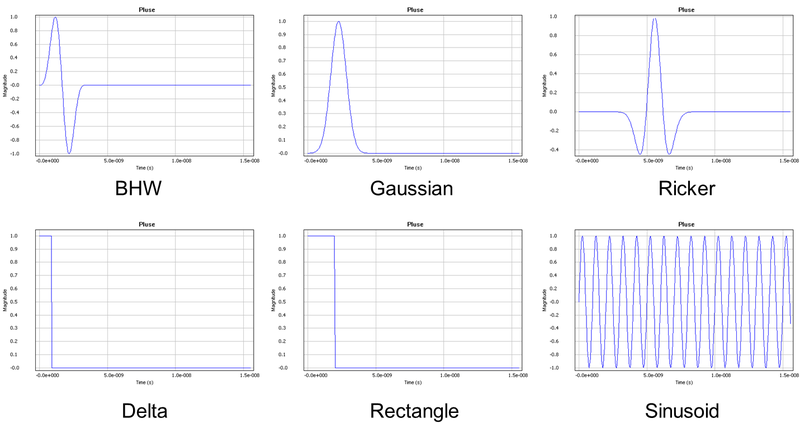 Comparison of main signal characteristics. Fig. 10. Demonstration of noise suppressing effects with the isolator. 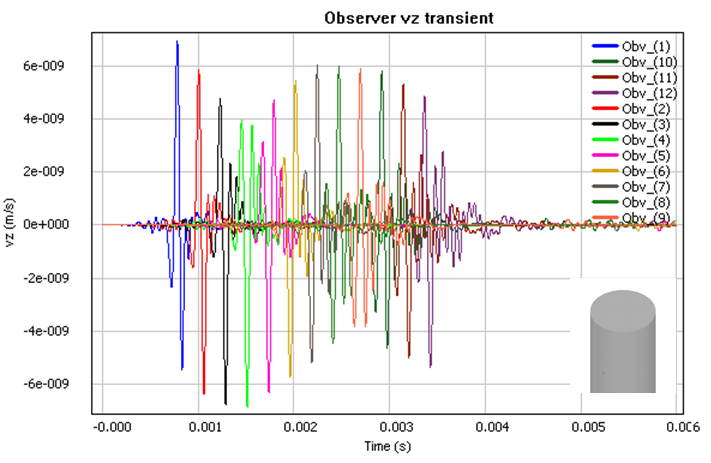 Wavenology EL can simulate transient 3D elastic wave propagation in complex geometries designed for the sonic logging tool. 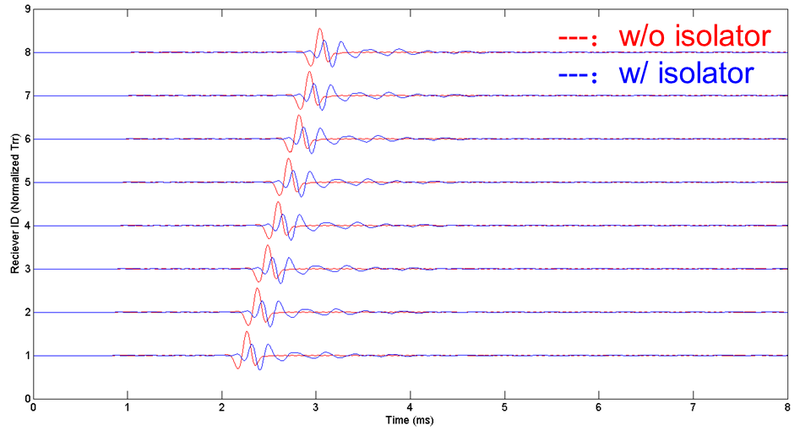 In the following example, elastic wave propagation in a open borehole filled with water, a borehole filled with a simple steel pipe and a borehole filled with a sonic logging device is simulated through Wavenology EL. Fig. 1 shows designed models for the three mentioned cases, respectively. Fig. 11. Problem setup. 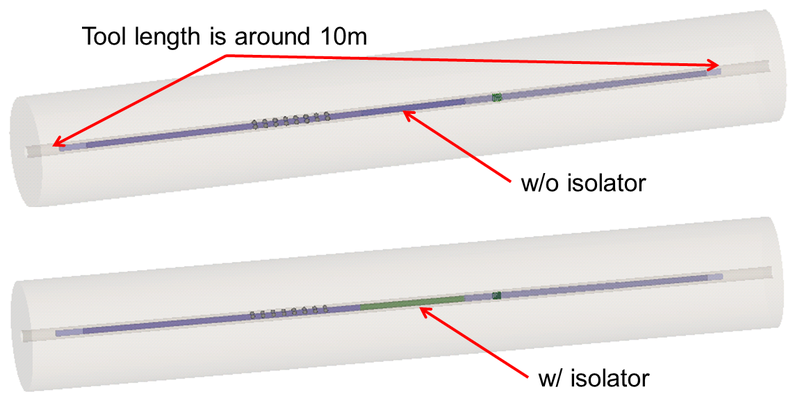 Left: Water filled borehole; Middle: Simple steel pipe in the water borehole; Right: A simple sonic logging device in the water borehole. Wavenology EL will automatically discretize the designed geometries with cylindrical meshes. The mesh examples of the above designed geometries are demonstrated in Fig. 2. Fig. 12. Meshes of the geometries. Left: Water filled borehole; Middle: Simple steel pipe in the water borehole; Right: A simple sonic logging device in the water borehole. The three problems are simulated in Wavenology EL. Speed observers are put along the z direction of the borehole to measure the parameters of interest. In Fig. 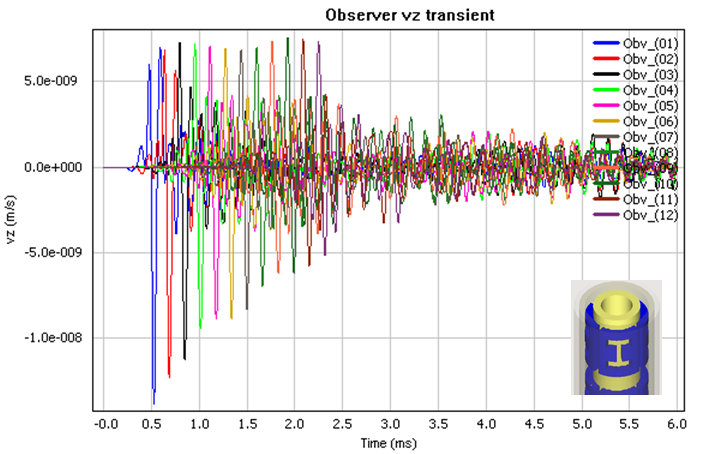 3, speed Vz measured by different observers displayed. Fig. 13. 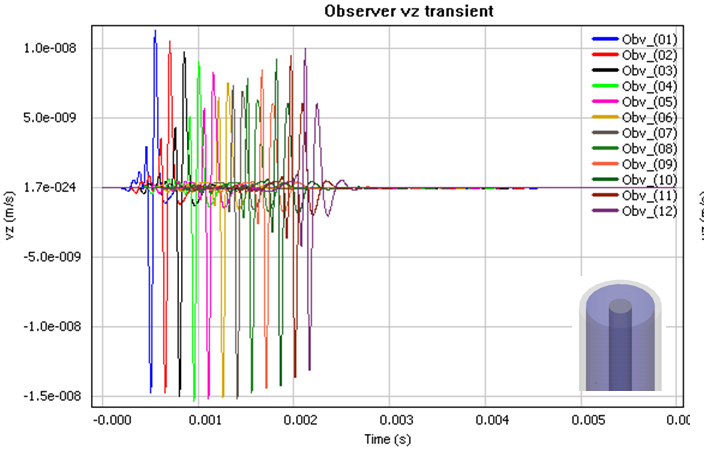 Measured speed at observers. (a) Water filled borehole; (b) Simple steel pipe in the water borehole; (c) A simple sonic logging device in the water borehole. 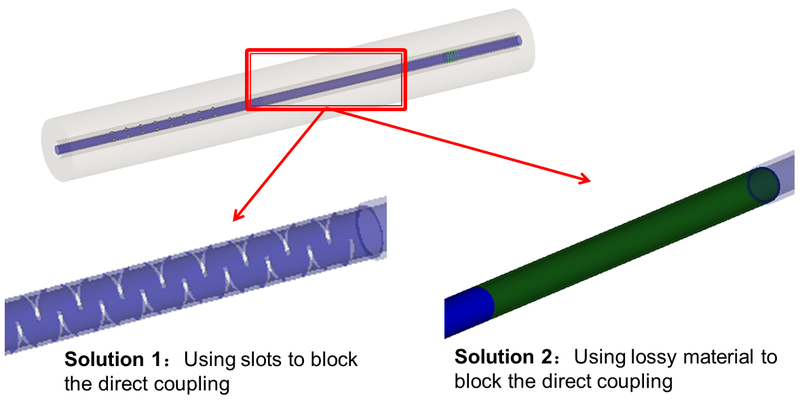 The simulated 3D transient elastic waves can also be displayed via snapshots defined on specified surfaces, which gives more information and straightforward explanation of how the waves are propagated along the borehole structure. Fig. 4 illustrates the elastic wave propagations in the three structures, in which three surfaces including z-cut, phi-cut and r-cut planes are defined. Fig. 14. Snapshots of the elastic wave propagation. (a) Water filled borehole; (b) Simple steel pipe in the water borehole; (c) A simple sonic logging device in the water borehole. 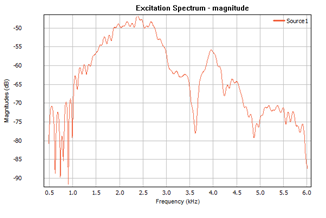 From this example, it has been demonstrated that Wavenology EL can be used to design sonic logging tools. It should be remarked that the software is very powerful and can provide an end-to-end solution of the entire design process, including complex geometry modeling, automated mesh generation. monopole and dipole source injection, probe observation and snapshot definition.